In collaboration with Thai Yamazaki Co. Ltd. and Sodexo, with support from the Department of Empowerment of Persons with Disabilities, the Ministry of Social Development and Human Security of Thailand, Thai Beverage Public Company Ltd., Nissan, Government of Japan through the Embassy of Japan in Thailand, and Japan International Cooperation Agency, the Asia-Pacific Development Center on Disability (APCD) welcomed 38 Thais with disabilities for the 'Orientation for Skills Development Training for Persons with Disabilities: Employability in Food Business 2017' on 24 to 28 April 2017 in Bangkok, Thailand. 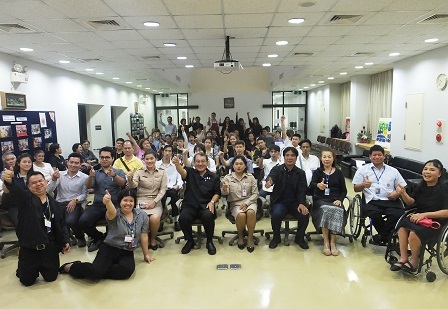 The orientation aims to empower Thai persons with disabilities by developing their vocational skills in an open, inclusive and accessible working environment. It also aims to demonstrate the concept of disability-inclusive business that will result in improved participation of persons with disabilities in society. Among the guests who gave opening remarks at the orientation were Mr. Akiie Ninomiya (Executive Director, APCD), Ms. Nata-orn Indisri (Director, Fund for Empowerment of Persons with Disabilities, Ministry of Social Development and Human Security), Ms. Dusita Chaolert (Director, Rajvithi Home for Girls), and Mr. Chatuporn Sornboonta (Assistant Manager, Production and Technology, Thai Yamazaki Co. Ltd.). 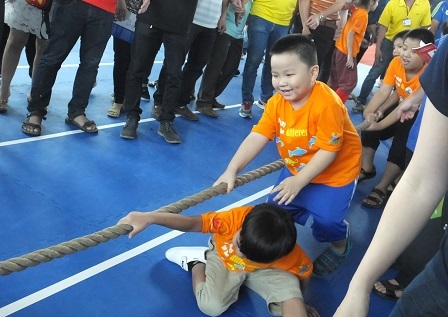 Following the success of the 1st Vietnam Autism Awareness Day held in April 2016, the Ministry of Labour - Invalids and Social Affairs (MOLISA) in cooperation with Vietnam Autism Network (VAN), Vietnam Federation on Disability (VFD) and APCD organized the 2nd Vietnam Autism Awareness Day with two main activities: Policy Workshop on 'ASEAN Autism - Issues, Demands and Solutions' and the 2nd Autism Friendship Games. The event aimed to raise awareness about autism and find out the needs, issues and solutions to help persons with autism integrate into their communities and society. Among the special guests that took part in the event were H.E. Mr. Vongthep Arthakaivalvatee (Deputy Secretary General, ASEAN for Socio-Cultural Community), Mr. Nguyen Trong Dam (Vice Minister, MOLISA), and Mdme. Dang Huynh Mai (Chairperson, VFD). The APCD met with the Ministry of Foreign Affairs (MOFA) Director General of the Department of Information, Mdme. Busadee Santipitaks for a courtesy call and to explore further collaboration and partnerships on matters regarding disability issues. 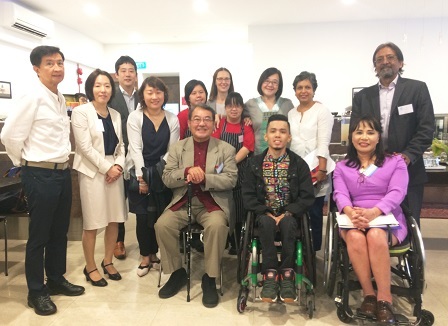 Both offices exchanged information on their respective projects and APCD also extended an invitation to MOFA for the upcoming 'Disability-Inclusive Drum Performance in ASEAN and Japan' on 2 to 3 June 2017, which showcases drummers with diverse disabilities from the 10 ASEAN member states and Japan. The 2nd Steering Committee Meeting for the 'Asia-Pacific True Colours Festival 2018' was held in Singapore on 16 to 18 April 2017. The meeting was conducted in collaboration with The Nippon Foundation, Very Special Artist (VSA), APCD, UNESCO, and other partners. Among those who graced the occasion were Mr. Akiie Ninomiya (Executive Director, APCD), Ms. Eriko Takahashi (Program Director, Disability and Child Welfare,The Nippon Foundation), Mr. Indrajit Banerjee (Director, Knowledge Societies Division, UNESCO, and Mr. Andy Liew (Chairman, Very Special Arts Singapore), among others. The four-day festival is expected to feature a line-up of highly talented local and international artists with disabilities, including singers, dancers, musicians, theater practitioners, among others. 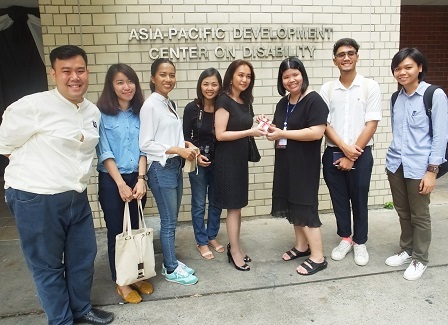 Students from the Department of Psychology, Faculty of Liberal Arts at Thammasat University visited the APCD on 7 April to learn more about disability and accessibility. Apart from being oriented about APCD's regional projects and activities, the visitors also interacted with APCD's 60 Plus+ Bakery & Cafe's trainees with disabilities. A study visit was conducted by students from the Faculty of Architecture of King Mongkut's Institute of Technology Ladkrabang on 5 April 2017. The students expressed interest in learning more about Universal Design and were given a tour of APCD's fully accessible facilities. 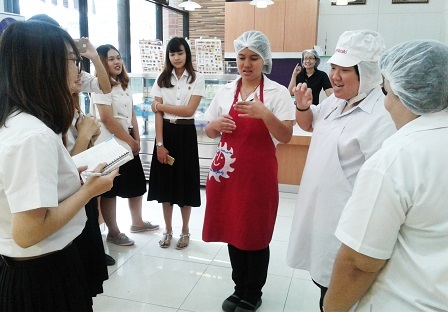 They also visited the 60 Plus+ Bakery & Cafe, a human resource training platform for Thai persons with diverse disabilities, to know more about the disability-inclusve business model.